It’s been over a month since I started this series, and, as if it senses its imminent demise, the clutter has accumulated with ferocity. Okay, I know this has more to do with the insanely busy schedule I’ve had this past month (the concert was lovely, I will bli neder post about it sometime in the near future) than the cognition of my clutter, but the end result is the same. Piles, piles and more piles. My piano is an especially vulnerable place for accumulation. It provides a lot of surface area and does not get used as much as I would like, so it functions somewhat like a table for long stretches of time. And, as anyone who battles clutter is aware of, if there’s an immobile surface, it will get used as a resting place for things that really belong somewhere else. It’s not so terrible, for sure, but if left unchecked, the piano would soon be buried, and then it would be an even bigger project (thus, more likely to be procrastinated). The first point of order was to assess what needed to go where. It was mostly paper clutter, with a few assorted toys, which simplified things greatly. I hung a bag from each of those oh-so convenient knobs and went to work. One bag was for recycling, the other for papers containing divrei Torah (some people don’t throw those away or recycle them). This made the clean up go fairly quickly. While sorting through the papers, I returned most books to the shelves, since the bookshelves surround the piano. 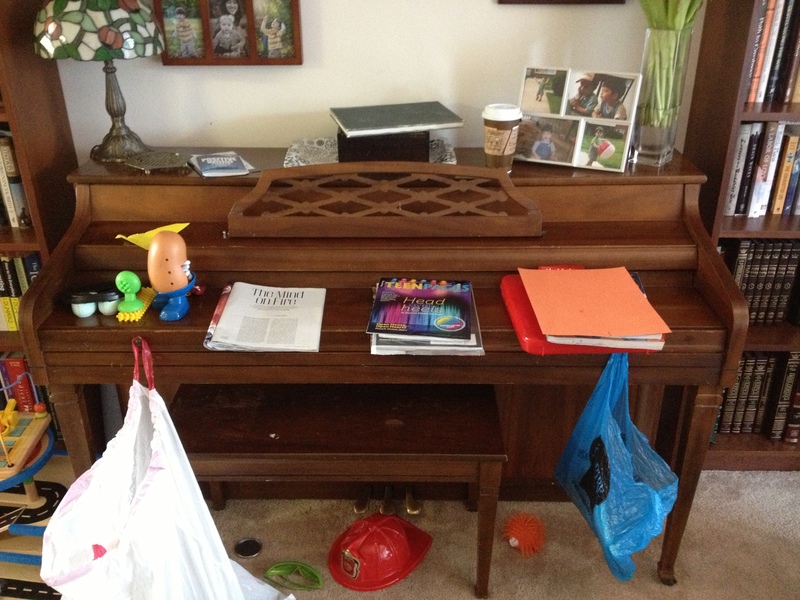 For things that required me to walk to another room, I made some piles on the piano to redistribute at the end. When I walk into another room, the chance of me getting distracted is very high, so this is a way to stay on task. That’s pretty much it. After this step it was a snap to clean things up and clear off the piano. I could even play it now if I wanted to (well, my two little ones are both napping, so I’m going to take a rain check on the piano playing. Maybe tonight). As a major perk, the positive energy I expended while clearing off the piano motivated me to switch the pictures in that silver picture frame on the top there. The previous pictures were from about a year ago, so it was time to replace them with some that were more current. This is the kind of thing that I will procrastinate forever if not otherwise motivated to update. I’m so glad that I took the time to do it! The whole process took me about 45 minutes, and that’s including a phone call, various mothering things I was doing, and getting distracted about three times. Not bad for a Thursday morning! What space in your home would you love to tidy up a bit? 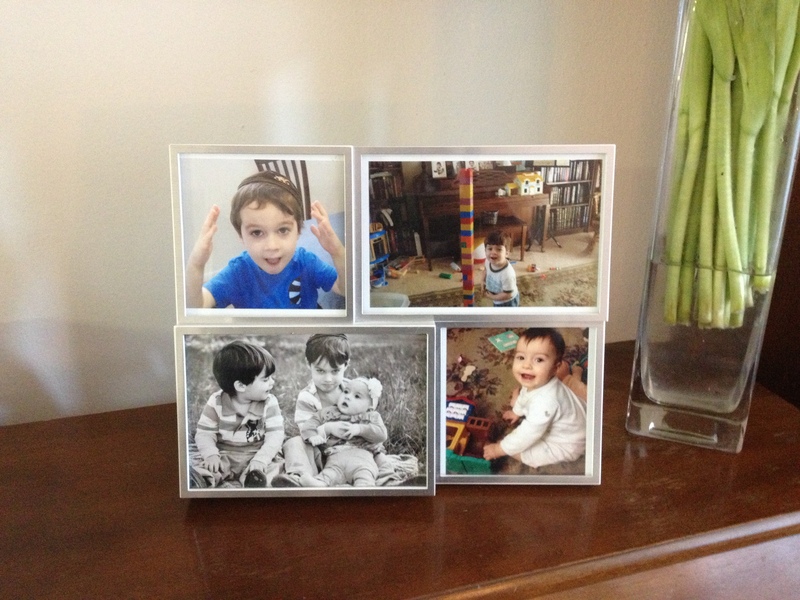 I love that you swapped out the kids’ photos. Call me crazy, but I like that your house looks lived in I don’t see it as clutter. ;) I know, you kinda want to punch me in the throat right now — but it’s true! Oh yeah. That’s crazy-making. Good for you! I loved the article. 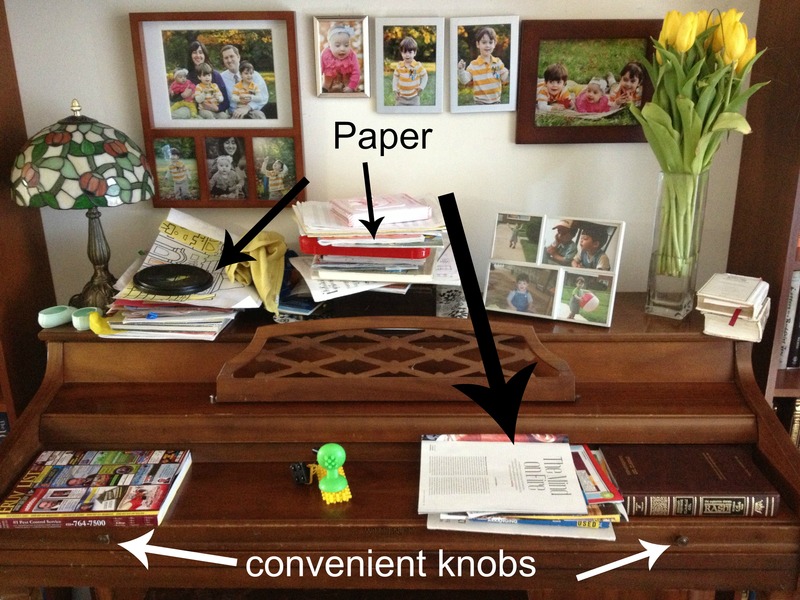 I am pretty bad about letting things just accumulate on surfaces too. My kitchen table is one of those places. My dining room table can also be one. To solve that problem I have learned that if I don’t put a table cloth oh the table and I take off the table pads, it stays clean. Now for the tough job. I have to polish the tea service(coffee pot, sugar bowl, creamer, and tea pot and big silver tray. Thanks Isabel! Oh boy, polishing the tea service. That’s a thing. My mother-in-law taught me a trick about salt, baking soda and boiling water. It polishes the silver pretty well, but I haven’t done it in ages. Maybe it’s time to make things shiny, too. Thanks for the reminder! 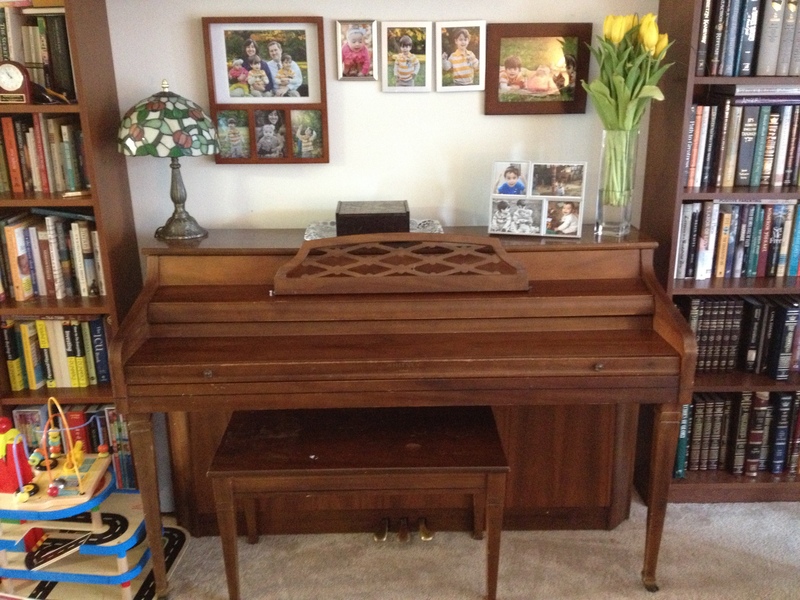 Yeah…my piano needs some TLC, too. Maybe next week. This week was just getting caught up on laundry and switching clothing seasons (boo…most. hated. job.). I like the idea of just devoting a whole morning to it, instead of fooling myself into thinking it will only take 5 minutes. When that happens, all the clutter just gets shifted to another place (like my bedroom) instead of being actually sorted through and dealt with. I know the moving clutter from one point to another tactic all too well. Our bedroom is definitely the place things go to be forgotten! Good luck on the piano. I’m still waiting for the weather to settle down enough to do the clothes switching thing. I don’t trust that the cold weather is really gone yet. Maybe in July…. 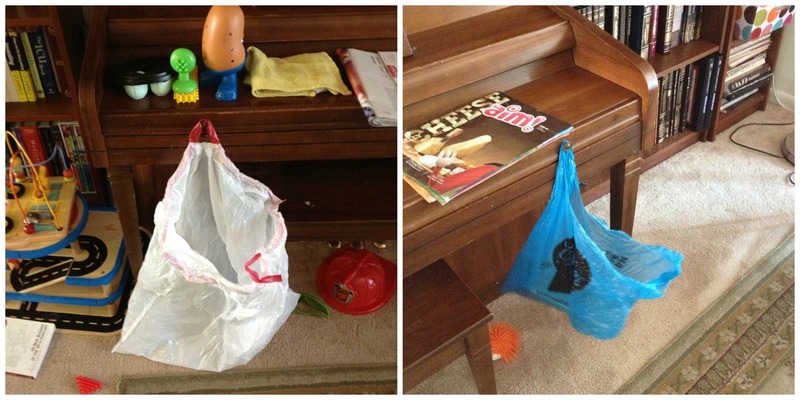 Isn’t it amazing how even a little decluttering feels SO good? We got rid of all the board games that are missing half of the pieces. Felt FABULOUS! Nice! We have yet to enter the realm of board games, but we have plenty of broken toys or toys with missing pieces. I’m adding that to the to-do list. Thanks!